The idea was fairly simple, but the execution a little complex. Small incendiary bombs were to be strapped to bats. These bats would then be housed in a bomb “like” container. Dropped from a plane, the container could land anywhere (but not explode) on a building rooftop (most likely a factory or weapons plant) in the street or military training center and the mechanism would then release the bats to chaotically fly out with their little bomb attached. The bats would, as they do in daylight hours, seek refuge in dark corners such as eaves, attics, nooks and crannies. 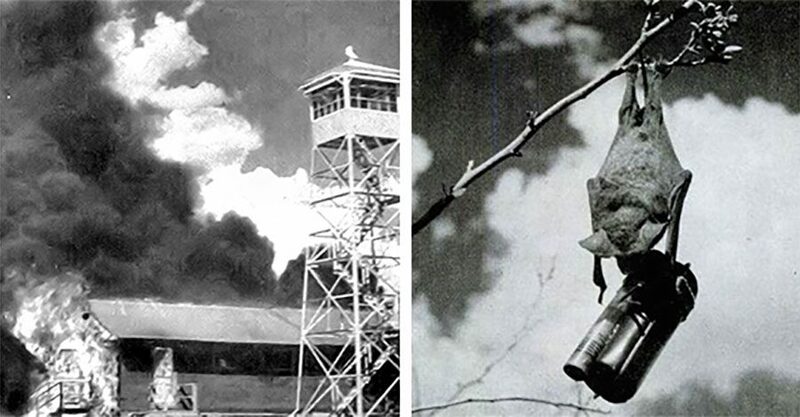 The bombs, on a timer, would then go off, setting small fires in different areas causing damage that the Japanese would have trouble controlling due to their scattered and unpredictable nature. Americans had the notion that most of the buildings in the crowded cities of Japan were made of wood, paper and bamboo. In a munitions plant, the little flying bombs would be lethal. The idea was to literally bombard Tokyo, Osaka and other industrial areas of Japan with bat bombs prior to an invasion. However, there were problems. How much weight could the bat carry? How to drop the bats without killing them first? How does one control thousands of bats? What type of explosive should be used? Doc Adams, with the help of his odd-ball team came up with the answers. They settled on the Mexican free-tailed bat for a few reasons. Though they were relatively smaller than other species (1/2 an ounce in weight on average) they carried their young and all told could carry up to two times their body weight. They were also in abundance… there were millions of them. However, the smallest bomb at the time weighed about 2 pounds. A new, lighter bomb would have to be invented that the bat could carry. Dr. Louis Fieser (the inventor of napalm) was brought on to the project and concocted a tiny, but potent napalm-like bomb with a thirty-minute time delay that would be pinned to the skin of the bats chest. Total weight 0.6 ounces. Problem one solved. On to problem two, controlling the bats enough to drop them out of a plane! Doc Adams devised what can truly be called a ‘contraption’ that would house the armed bats safely and send them flying at the appropriate time. The “bat bomb” looked like a regular bomb, but in truth it was more of a carrier. After cooling the bats in ice trays, which lulled them into hibernation, these round trays were placed inside the bomb, which had three stages of deployment. The bomb would be dropped at 5000 feet. At 1000 feet it would deploy a parachute to slow it’s descent. At the same time the outer shell of the bomb would open and fall away and the bat trays and their bases would separate like an accordion. The bats would drop a few inches onto the base of the tray and as the “bomb” continued it’s slow descent; the bats would wake up and start flying willy-nilly. The extra weight of the attached bomb and the daylight would make them seek shelter poste haste. Each bat bomb housed 1040 bats. It was time for a test. The U.S. Army conducted the initial development of the project and the first trials were somewhat comedic. In Carlsbad, New Mexico, on an Army Auxiliary Airfield, six “loaded” bats were accidentally set free and the newly built airfield, a fuel tank and unfortunately a General’s car all went up in flames. “In a way”, noted Adams, “this accident proved the bat bomb would work. Look what 6 bats could do!” The Army soon turned the project over to the Navy and eventually the Marine Corps took over research and testing. Some speculate that it was due to the Marines being heavily involved in the Pacific theatre. The project was moved to a remote area near Dugway, Utah and after approximately 30 test runs and a little over $2 million dollars spent on “X-RAY” the final test went off without a hitch. The Marines had built a mock-Japanese village and the bat bomb worked perfectly. The village was in flames after 45 minutes of the drop. There were still a couple of glitches that needed to be worked out, such as how to keep the bats in cold hibernation during a long flight over the Pacific and issues about the bat’s behavior patterns and seasonal rhythms. However, all that was naught as Project X-Ray was mysteriously cancelled in February of 1944. Many who were involved with the project believe that the top brass discontinued the bat bomb in order to steer funds towards another top-secret project that held the code name, The Manhattan Project. After seeing the heavy loss of life and devastation caused by the atomic bombs, Adams wrote, “Think of thousands of fires breaking out simultaneously over a circle of 40 miles in diameter for every bomb dropped. Japan could have been devastated, yet with small loss of life.” As for Doc Adams, he would go on to try other whacky inventions such as a fried chicken vending machine or jumping in an airplane and scattering the western prairies with synthetic grass seed to reforest burned out areas. More on this topic can be found in video on youtube.com and in a book devoted to the subject titled, “BAT BOMB” by Jack Couffer (who actually served on the “Project X-Ray” team).